There are thirteen simple, yet vital key ingredients of Gracious Leadership. All of the key ingredients are required, and no shortcuts are allowed when leaders seek to develop and to sustain highly engaged, enthusiastic teams that produce consistently excellent results for their organizations. When leaders follow the key ingredients of Gracious Leadership, they stand out from the crowd. Yes, Gracious Leaders are set apart because they have found a better way to lead. Employees in the workplace… and people throughout our nation at large are starving for positive leadership at each level of every organization. In businesses and industries of all types, within for-profit or non-profit companies and diverse governmental entities, Gracious Leaders can and will make our world a better place because they will lead like they have never led before. How can you become a Gracious Leader? What specific steps should you take to apply each of the key ingredients of Gracious Leadership? Remember that all 13 key ingredients are required, and no short cuts are allowed! 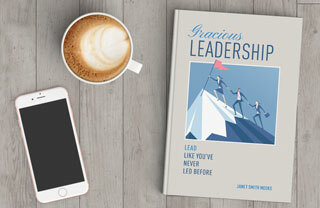 Gracious Leadership: Lead Like You’ve Never Led Before includes important “how to” steps that support your efforts to become a fully respectful leader who expects consistent excellence from your team.